Bière de Garde or “beer for keeping” is a French pale ale traditionally brewed in the Nord-Pas-de-Calais region. It is a strong pale ale, cellar aged for an extended period before consumption. This week, I take a look at the history of this style and how to brew it at home. Bière de Garde has its roots in the French/Belgian farmhouse ale brewing tradition centered around the Flanders region along the Belgian/French border which flourished in the late 19’th century. Many small breweries and farmhouses brewed farmhouse ales such as Saison and Bière de Garde. The region was devastated during the First and Second World Wars, destroying most of the original breweries and farms. The style was kept alive by a handful of brewers in small farms and villages. Bière de Garde made a very slow comeback in the latter half of the 20th century, but is still not as well known as its farmhouse cousin Saison or the much more popular Belgian ales. It was traditionally brewed only in winter and then aged for consumption in warmer weather, but is now brewed year-round. A number of fine Bière de Gardes are now available commercially including: Jenlain (amber), Jenlain Bière de Printemps (blond), St. Amand (brown), Ch’Ti Brun (brown), Ch’Ti Blond (blond), La Choulette (all 3 versions) and more. Bière de Garde comes in three variations (Blond, Amber and Brown) which vary primarily in color from golden-blonde to deep brown with an overall rane of 6-19 SRM. The darker variations tend to have a more complex flavor profile. It is a strong pale ale with medium to high malty flavor often with hints of toast, caramel or toffee. 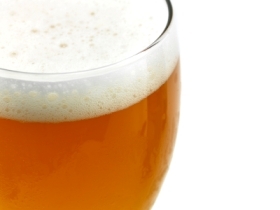 Unlike English pale ale, it has low to moderate esters (fruitiness) and alcohol flavor. It has low to no hop flavor with balance tilted towards the malt. The beer is fairly stron (6-8.5% alcohol) with a starting gravity of 1.060-1.080. The finished beer should be smooth and well aged. It has a much rounder, sweeter, maltier character than a Saison and also lacks its spicy flavor. Clarity can vary from good to poor, and some haze is acceptable. It is usually served highly carbonated with a good head, and may have a slightly dry finish. Attenuation with this beer is typically very high – in the 80-85% range, and final gravity in the 1.008-1.016 range. Bière de Garde is made from a pale malt base (60-80%) with the addition of Munich and Vienna malts (10-25%) for maltiness. The blond variation is typically made without crystal malts, though the darker variations often include crystal malt additions to achieve the desired color. Sugar is sometimes used to enhance the dry finish in the beer and aid in attenuation. A lower temperature (light body) mash profile is used to achieve high attenuation. Darker variations sometimes use an extended boil to caramelize the wort for a darker color and rich flavor. Soft water is used for mashing. Continental hops are used with a floral or slightly spicy aroma such as Hallertauer, Tettnanger, or Saaz. These are used in small quantities to balance the beer towards the malty side (only 18-28 IBUs of hops typically), since hop flavor is not a significant component of this beer. True farmhouse ales often use indigenous yeasts and molds that are hard for a home brewer to precisely duplicate. Some good options include White Labs French Ale (WLP072), White Labs Belgian Saison (WLP565), Wyeast European Ale (1338), and Wyeast French Saison (3711), though some brewers also use Belgian ale yeasts. Bière de Garde is usually fermented at ale temperatures and then cellared for an extended period before drinking. The finished beer is served well carbonated and should have a robust white or brown head depending on the color variation. Thank you for joining me on the BeerSmith Home Brewing Blog. If you would like an article on home brewing sent to you each week, please subscribe to my newsletter. Also check out my podcast on home brewing. This recipe (http://beersmithrecipes.com/viewrecipe/22090/biere-de-garde) reminds me greatly of a Belgian Duvel (especially) or perhaps a Tripel recipe. Considering the geographical relationship between the traditional production locations, I would not be surprised to find a direct relationship somewhere in their history.